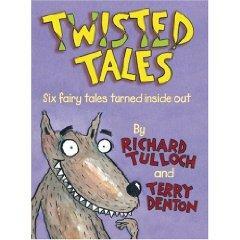 Reading twisted fairy tale stories are fun for both children and adults. These hilarious takes on traditional favorites are perfect for reading at home or in a school setting. Just because a fairy tale is slightly different from the version you traditionally understand does not necessarily make it "twisted." After all, in the history of fairy tales, many cultures change the tale to suit their purposes. Generally, though, the basic premise and outcome stay the same. Sometimes the twisted tale is appropriate for both adults and children, though some elements may pass over a very young child's head, like in politically correct fairy tales. Test your knowledge of fairy tales with a quiz from LoveToKnow Children's Books. Fractured Fairy Tales by A.J. Jacobs: These tales are based on the segment "Fractured Fairy Tales" that were commonly seen on the Rocky and Bullwinkle show during the 1960s. It includes 25 retold stories, including new twists on Jack and the Beanstalk, King Midas and Pinocchio. 12 Fabulously Funny Fairy Tale Plays by Justin McCory Martin: Kids will get a kick out of staging these hilarious new versions of classic fairy tales. Use them in the classroom as part of a reading exercise or take them to your next family reunion. Tales include "Spiderella", "Goldilocks" and the "Three Bullfrogs" and "Little Late Riding Hood". Twisted Fairy Tales: Six Fairy Tales Turned Inside Out by Richard Tulloch (Author) and Terry Denton (Illustrator): These tales are written from the point-of-view of eyewitnesses and the presumed "villains" of classic fairy tales. Newfangled Fairy Tales by Bruce Lansky: Upper elementary students will enjoy the quirky contemporary takes on the tales they heard as children. "King Midas", "Sleeping Beauty" and "The Princess and the Pea" are all included in this modern version of tales. The Stinky Cheese Man and Other Fairly Stupid Tales by John Scieszka (Author) and Lane Smith (Illustrator): This book takes the typical fairy tale and turns it upside down. The narrator of the book even makes fun of the book itself, and characters do not stay in their own stories. Another take on the twisted tale is instead of rewriting the story, authors will write sequels about what happens after the story's ending. In Goldilocks Returns, by Lisa Campbell Ernst, the title character revisits the bears and spruces up their home, much to the bear's dismay. The Frog Prince Continued, written by John Scieszka, tells how the princess and the frog didn't quite live as "happily ever after" as the original version would have the readers believe. Read the classic fairy tale followed by the twisted version; have the child point out all the plotline differences. Discuss the different morals presented by the two versions of the tale. Children can write their own version of a favorite fairy tale, altering the story and ending to what they think should have happened. Present the tale as a dramatic play, using the book as their script. Twisted fairy tale stories provide a great launching board for building vocabulary and comprehension work. By giving children a look at books that have a different version of facts, kids develop critical thinking skills necessary in life.